Weckerlin, Jean-Baptiste. Musiciana, extraits d’ouvrages rare ou bizarre, Paris, 1877. Schott, Gaspar. Magia Naturalis 1657. Champfleury. Les Chats, Paris, 1870.
de Estrella, Juan Christoval Calvete. El Felicissimo Viaje d'el Muy Alto y Muy poderoso Principe Don Phelippe, Antwerp, 1552. Kircher, Athanasius. Musurgia Universalis Rome, 1650. Excerpt from Richards, Robert J. 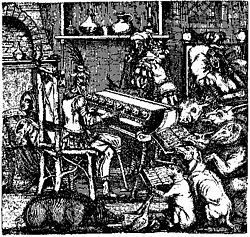 "Rhapsodies on a Cat-Piano, or Johann Christian Reil and the Foundations of Romantic Psychiatry", 1998. 鈴木潔 (2007). “アタナシウス・キルヒァーの情動説”. 言語文化 (同志社大学) 9 (4): 697-720. https://doi.org/10.14988/pa.2017.0000011082.